Replacement filter for Austin Air HealthMate Jr Air Purifier. HealthMate Jr Filter FR200. 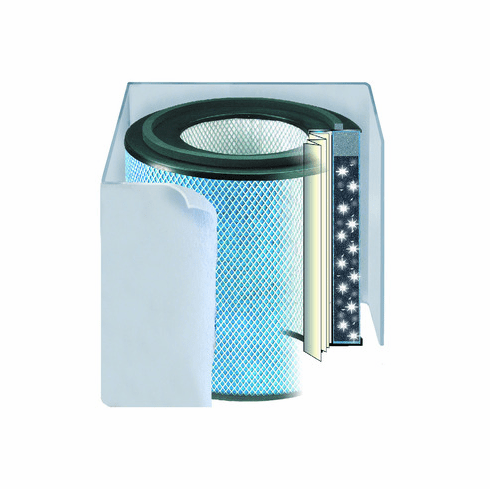 The Austin Air HealthMate Jr filter is constructed of 30 sq. ft. of certified true certified true medical High Efficiency Particulate Arresting (HEPA), the most effective filtering media in the industry for its ability to remove 99.97% of all particles, like bacteria and viruses, down to 0.3 microns and 95% down to 0.1 microns. The HEPA media is surrounded by 6.5-lbs. of an activated carbon/zeolite mixture that absorbs odors, smoke and VOC’s. Activated carbon is porous, thereby increasing the surface area available for absorption. Zeolite is a microporous mineral that aids in the absorption of some compounds better than activated carbon. This filter fits all junior size Austin Air purifiers.